ROHO High Profile Single Compartment Wheelchair Cushions BUY Pressure Ulcers Cushion, High Profile Wheelchair Cushion, Single Compartment Cushion, 1R1010C, 1R109C, 1R1110C, 1R88C, 1R910C, 1R99C, Wheelchair Cushions. 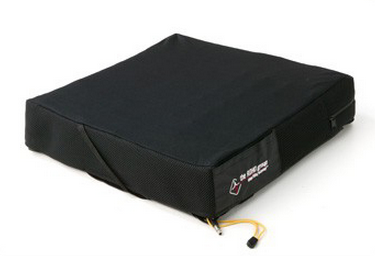 ROHO Wheelchair Seat Cushions provide pressure relief for individuals who are wheelchair bound. The ROHO High Profile Wheelchair Cushion has 4 inches of interconnected air cell height that adjust to the individual needs of the wheelchair patient. Manufactured by the ROHO Group, this High Profile Wheelchair Cushion is made with a single compartment and can be automatically adjusted to each patient for a completely personalized effect. The Single Compartment Cushions provide low deformation and counter-pressure that assists in the healing of ischemic ulcers. 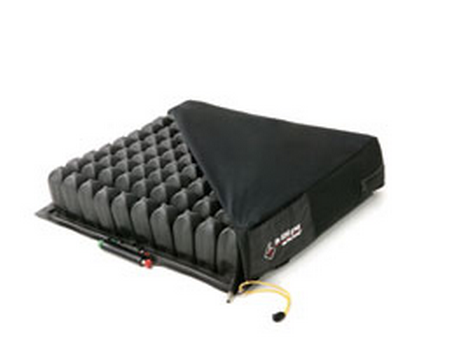 ROHO High Profile Single Compartment Wheelchair Cushions weigh only 3.8 pounds. Using proprietary air seat technology, this ROHO cushion contains a unique design that allows the seat cushion to constantly adjust to a person's body movement. The adjustment and conformity of the air cells accommodate and meet the one-of-a-kind skin integrity needs for each individual. The ROHO Cushion is appropriate for patients at high risk of pressure ulcers, making it the ideal high profile wheelchair cushion for a variety of different types of patients. You might also be interested in similar ROHO cushions, such as the Low Profile Wheelchair Cushion designed with 2 inches of height. 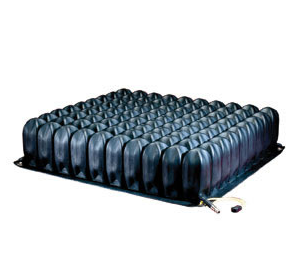 Inflatable air seat cover and cushion. Contains convenient hand inflation pump and repair kit. Air Cushion assists in the healing of ischemic ulcers. Patchable and repairable cushion allows for long-term use. Cellular design provides adjustment to individual needs and ultimate comfort. Decreases friction and shear via soft, pliable cushion material. Provides low deformation and counter-pressure. Cushion is easily cleaned with soap and water and cover is machine washable. Designed for high risk ulcer patients and is completely lightweight. Product Numbers: 1R1010C, 1R109C, 1R1110C, 1R88C, 1R910C, 1R99C. Size Options (Inch, Width x Depth): 15 x 16, 16 x 15, 16 x 16, 16 x 18, 18 x 18, 20 x 18. Interconnected Air Cell Size: 4 Inch. HCPCS Code: E2622, E2623, K0108. ROHO High Profile Cushions offers information about applications and specifications. Wheelchair Cushion Detailed Adjustment Instructions covers the proper setup and adjustment of the cushion for individual needs. 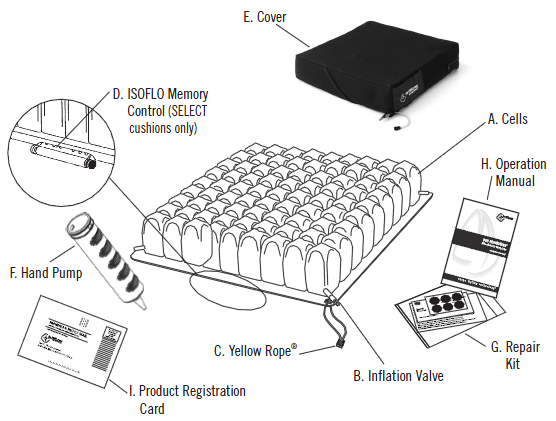 ROHO Cushion Instructions provide information for set up and adjustment. Dry Floatation Cushion offers information on floating seat technology. Wheelchair Seating HCPCS Codes offers a guideline for selecting the appropriate HCPCS code for wheelchair cushions. ROHO Air Cushion Cleaning covers the procedures for cleaning wheelchair cushions from ROHO. 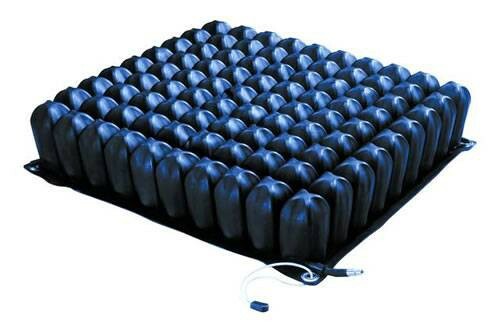 ROHO Dry Floatation Wheelchair Cushion charts the number of cells by cushion dimensions. ROHO Cushion Repair discusses step by step repair of air cushions. Braden Scale for Pressure Sores provides a chart for risk assessment. ROHO Cushion Warranty identifies ROHO’s limited warranty policy for cushions. Parsons, David. A deeper look into the R&D of seating surfaces made to prevent pressure sores. Medical Design News. September/October 2001. Clinical Case Study. Healing an Ischemic Ulcer (Pressure Ulcer in a Seated Client. Crown Therapeutics, 1997. This is a very great price for a great product my son absolutely loves it and can't wait to order more products from this website highly recommend. 86-year old with spinal stenosis unable to sleep in bed, spending all day in chair, obtains Stage IV pressure ulcer on tailbone. With wound clinic and wound nurse care, 24/7 wound vacuum, and Roho cushion, size and depth continues to reduce. Vitality Medical delivered essential cushion speedily. GREAT DEAL & GREAT PRODUCT. OVER $300 FOR A SEAT CUSHION SOUNDS TERRIBLE, BUT THE COMFORT IT GIVES IS WORTH MANY TIMES THE $$$. A God send for people with sciatica to help to sit longer with less pain. My name is Jim Davis and I have had severe sciatica for 17 years. A man that had been in a wheel chair for decades told me about the ROJO cushion. I didnt try it for a year, but when I did, Lord was I glad ! I wouldnt be without it for $10000.00! Great product. This is our 2nd one. There is no equal to this great product. We needed a second one, even tho the one we bought 3 years ago is still going strong. No compression sores even tho my husband is wheelchair bound. Literally helps me avoid pain in the a**! Very easy to use as it comes with a pump. It's also feels nice sitting on the wheelchair with this comfortable cushion. It is kind of like a minor exercise as well. As being a wheelchair patient for years, I cannot emphasize enough how important this seemingly simple cushion is. It has helped me not to have pressure sores. Not to mention, I could be in my wheelchair more comfortable and it gave me more mobility. You could think it's a bit expensive but I do think it's definitely worth it!